I’m looking forward to giving two presentations in my home city in connection with this week’s national conference of the Canadian Association of Gift Planners (CAGP). In theory I’ll be talking about data-driven prospect identification for Planned Giving … “in theory” because my primary aim isn’t to provide a how-to for analyzing data. Rather, I will urge fundraisers to seek “data partners” in their organizations — finding that person who is closest to the data — and posing some good questions. There’s a lot of value hidden in your data, and you can’t realize this value alone: You’ve got to work closely with your colleagues in Advancement Services or with any researcher, analyst, or IT person who can get you what you need. And you have to be able to tell that person what you’re looking for. What is the average age of new expectancies, at the time they became known to your organization? What is the size of your general prospect pool? The answer to the first question might suggest that more active prospect identification is required, of the type more often associated with major-gift fundraising. If the average age is 75 or older, I have to think that earlier identification of bequest intentions would benefit donor and cause alike, by allowing for a longer period for the conversation to mature and for the relationship to develop. The answer to the second question gives an indication of the potential that exists in the database — but also the challenge of zeroing in on the few people (the top 100, say) in that universe of prospects who are most likely to accept a personal visit. Again, I’m talking about high-touch fundraising — more like Major Gifts, less like Annual Fund. As Planned Giving professionals get comfortable asking questions of the data, the quality of the questions should improve. Ideally, the analyses will move from one-off projects to an ongoing process of gathering insights and then applying them. Along those lines, I will be giving attendees for both presentations a taste of how some simple targeting via data mining might work. As Peter Wylie and I wrote in our book, “Score!”, data mining for Planned Giving is primarily about improving the odds of success. I said that I’m giving two presentations. Actually, it’s the same presentation, for two audiences. The first talk will be for a higher ed audience in advance of the conference, and the second will be for a more general nonprofit audience attending the conference proper. I expect the questions and conversations to differ significantly, and I also expect some of my assertions about Planned Giving fundraising to be challenged. Should be interesting! Since you’ve read this far, you might be interested in downloading the handout I’ve prepared for these talks: Data-driven prospect ID for Planned Giving. There’s nothing like being there in person for the conversation we’re going to have, but this discussion paper does cover most of what I’ll be talking about. If you’re visiting Halifax for the conference, welcome! I look forward to meeting with you. One morning some years ago, when I was a prospect researcher, I was sitting at my desk when I felt a stab of pain in my back. I’d never had serious back pain before, but this felt like a very strong muscle spasm, low down and to one side. I stood up and stretched a bit, hoping it would go away. It got worse — a lot worse. An hour later I was laying on a hospital gurney getting a Toradol injection and waiting for an X-ray. It was indeed a kidney stone, and not a small one. This post is not about my kidney stone. But it is a little bit about Bernardine. Like I said, she knew stuff. She diagnosed my condition from 40 feet away, and she was also the first person to suggest that I should present at a conference. At that time, there were few notions that struck terror in my heart like the idea of talking in front of a roomful of people. I thought she was nuts. ME? No! I’d rather have another kidney stone. But Bernardine had also given me my first copy of Peter Wylie’s little blue book, “Data Mining for Fundraisers.” With that, and the subsequent training I had in data mining, I was hooked — and she knew it. Eventually, my absorption with the topic and my enthusiasm to talk about it triumphed over my doubts. I had something I really wanted to tell people about, and the fear was something I needed to manage. Which I did. To date I’ve done maybe nine or ten conference presentations. I am not a seasoned presenter, nor has public speaking become one of my strengths. But I do know this: Presenting stuff to my counterparts at other institutions has proven one of the best ways to understand what it is I’m doing. These were the few times I got to step back and grasp not only the “how” of my work, but the “why”. This is why I recommend it to you. The effort of explaining a project you’ve worked on to a roomful of people you’re meeting for the first time HAS to force some deeper reflection than you’re used to. Never moving beyond the company of your co-workers means you’re always swimming in the same waters of unspoken assumptions. Creating a presentation forces you to step outside the fishbowl, to see things from the perspective of someone you don’t know. That’s powerful. Yes, preparing a presentation is a lot of work, if you care about it enough. But presenting can change your relationship with your job and career, and through that it can change your life. It changed mine. Blogging also changed my life, and I think a lot more people should be blogging too. (A post for another day.) Speaking and writing have rewarded me with an interesting career and professional friendships with people far and wide. These opportunities are not for the exceptional few; they are open to everyone. Today, playing the role of a Bernardine, I am thinking of who I ought to encourage to present at a conference. I have at least one person in mind, who has worked long and hard on a project that I know people will want to hear about. I also know that the very idea would make her vomit on her keyboard. But I’ve been there, and I know she will be just fine. A significant issue for gaining data-related skills is finding the right method of sharing knowledge. No doubt conferences are part of the answer. They attract a lot of people with an interest in analytics, whose full-time job is currently non-analytical. That’s great. But I’m afraid that a lot of these people assume that attending a conference is about passively absorbing knowledge doled out by expert speakers. If that’s what you think, then you’re wasting your money, or somebody’s money. There are two problems here. One is the passive-absorption thing. The other is a certain attitude towards the “expert”. Today I want to describe both problems, and prescribe a couple of conferences related to data and analytics which offer antidotes. You know the answer already: Knowledge can’t be passively absorbed. It is created, built up inside you, through engagement with an other (a teacher, a mentor, a book, whatever). We don’t get good ideas from other people like we catch a cold. We actively recognize an idea as good and re-create it for ourselves. This is work, and work creates friction — this is why good ideas don’t spread as quickly as mere viral entertainment, which passes through our hands quickly and leaves us unchanged. Sure, this can be exciting or pleasant work, but it requires active involvement. That’s pretty much true for anything you’d call education. Ever wish you could attend a live TED event? Well, the DRIVE conference (Feb. 20-21 in Seattle — click for details) captures a bit of that flavour: Ideas are front and centre, not professions. Let me explain … Many or most conferences are of the “birds of a feather” variety — fundraisers talking to fundraisers, analysts talking to analysts, researchers talking to researchers, IT talking to IT. The DRIVE conference (which I have written about recently) is a diverse mix of people from all of those fields, but adds in speakers from whole other professional universes, such a developmental molecular biologist and a major-league baseball scout. Cool, right? But if you’re going to attend, then do the work: Listen and take notes, re-read your notes later, talk to people outside your own area of expertise, write and reflect during the plane ride home, spin off tangential ideas. Dream. Better: dream with a pencil and paper at the ready. People may assume the person at the podium is an expert. The presenter has got something that the audience doesn’t, and that if it isn’t magically communicated in those 90 minutes then the session hasn’t lived up to its billing. Naturally, those people are going to leave dissatisfied, because that’s not how communicating about analytics works. If you’re setting up an artificial “me/expert” divide every time you sit down, you’re impeding your ability to be engaged as a conference participant. Every year, the Association of Professional Researchers for Advancement runs its Data Analytics Symposium in concert with its international conference. (This year it’s Aug 7-8 in Baltimore.) The Symposium is a great learning opportunity for all sorts of reasons, and yes, you’ll get to hear and meet experts in the field. One thing I really like about the Symposium is the case-study “blitz” that offers the opportunity for colleagues to describe projects they are working on at their institutions. Presenters have just 20 or so minutes to present a project of their choice and take a few questions. Some experienced presenters have done these, but it’s also a super opportunity for people who have some analytics experience but are novice presenters. It’s a way to break through that artificial barrier without having to be up there for 90 minutes. If you have an idea, or would just like more information on the case studies, get in touch with me at kevin.macdonell@gmail.com, or with conference chair Audrey Geoffroy: ageoffroy@uff.ufl.edu. Slots are limited, so you must act quickly. I present at conferences, but I assure you, I have never referred to myself as an “expert”. When I write a blog post, it’s just me sweating through a problem nearly in real time. If sometimes I sound like I knew my way through the terrain all along, you should know that my knowledge of the lay of the land came long after the first draft. I like to think the outlook of a beginner or an avid amateur might be an advantage when it comes to taking readers through an idea or analysis. It’s a voyage of discovery, not a to-do list. Experts have written for this blog, but they’re good because although they know their way around, every new topic or study or analysis is like starting out anew, even for them. The mind goes blank for a bit while one ponders the best way to explore the data — some of the most interesting explorations begin in confusion and uncertainty. When Peter Wylie calls me about an idea he has for a blog post, he doesn’t say, “Yeah, let’s pull out Regression Trick #47. You know the one. I’ll find some data to fit.” No — it’s always something fresh, and his deep curiosity is always evident. So whichever way you’re facing when you’re in that conference room, remember that we are all on this road together. We’re at different places on the road, but we’re all traveling in the same direction. It’s your turn to DRIVE! It’s been a full year since I attended the first DRIVE Conference in Seattle, and I’m pleased to let you know (if you don’t already) that a second one is on the way. 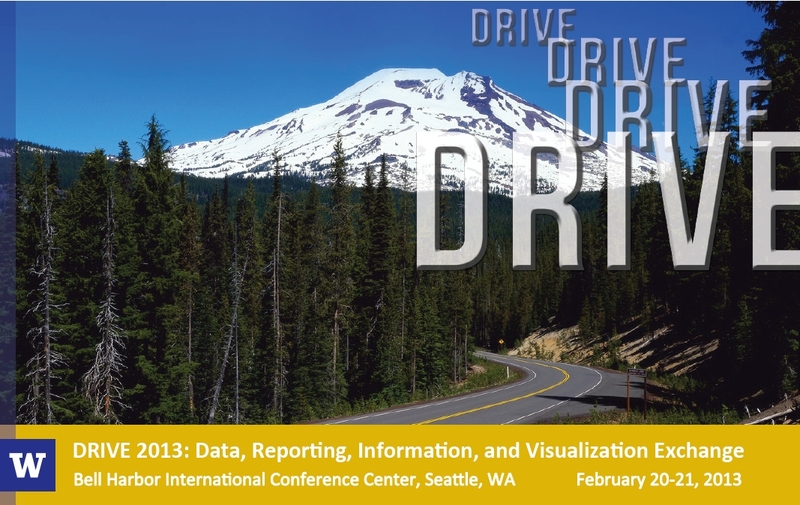 DRIVE 2013 takes place February 20-21 at the Bell Harbor International Conference Center in Seattle, Washington, and is hosted by the University of Washington. Registration is now open! I’ll be making the trip to DRIVE 2013, and I think you should, too. I’m there to speak, but I expect to get a whole lot more out of it than I give. DRIVE stands for those most awesome and beautiful words “Data, Reporting, Information and Visualization Exchange.” It’s a gathering-place for the growing community of non-profit IT/data people seeking to bring new ideas and efficient processes and systems to their organizations. Whether you’re just joining the non-profit ranks or you’ve been in the sector a while, this is the place to explore the latest ideas in analytics, modeling, data, reporting, information and visualization with people who are of like mind but come from all sorts of different backgrounds. It’s this diversity that really injects value into the “exchange” part of DRIVE: You’ll meet some fascinating people who will help you see data-driven performance through a whole new lens. Especially this year … wow. There are fundraisers and report-writers and data miners – all great. But a developmental molecular biologist? And a major-league baseball scout? Yes! On top of that, there’s an opportunity to sign up for some on-the-spot mentoring (either as a mentor or mentee) which will allow you to have a focused conversation on a topic of interest that goes beyond the merely social aspect of a conference. Check that out on the conference website. DR. JOHN J. MEDINA, a developmental molecular biologist, has a lifelong fascination with how the mind reacts to and organizes information. He is the author of the New York Times bestseller “Brain Rules: 12 Principles for Surviving and Thriving at Work, Home, and School” — a provocative book that takes on the way our schools and work environments are designed. ASHUTOSH NANDESHWAR, Associate Director of Analytics at the University of Michigan, will talk about how we can tackle the three biggest problems in fundraising using data science. KARL R. HABERL, of Principal BI will be presenting on the merits of powerful visualization. His presentation will introduce you to three innovative ‘compound charting techniques’ that provide new levels of insights to analysts and their audiences. ANDREW PERCIVAL, an advanced scout with Major League Baseball’s Seattle Mariners. For his presentation, Andrew will be speaking about the use of data in the game of baseball. Come hear how an MLB scout turns massive data sets into information that is used by coaches and front-office personnel. Oh yeah – and me, and a whole lot more. For more information on the other speakers and topics lined up so far, visit the DRIVE 2013 website. If you’re interested in working with data for the benefit of a non-profit organization or for education institutional advancement, then you must make room in your calendar for the APRA Symposium on Data Analytics. Kate Chamberlin of Memorial Sloan-Kettering Cancer Center recently posted the listserv message below which I am quoting in its entirety, with her blessing. Kate is Chair of this year’s Symposium, being held this summer in Minneapolis. I’ve attended a few of these symposiums (and presented at one), and I can tell you that they’re great. This is a conference where you can really learn, and meet the people who are doing cool stuff with data for their institutions and organizations. Of particular interest are the Case Study sessions, which are brief (20 minutes) presentations of analytics projects that your colleagues at other institutions have carried out. If you’ve worked on a such a project, consider sharing! Contact information is included below. Many of you may have noticed the fifth annual APRA Symposium on Data Analytics is definitely happening again this summer in conjunction with APRA’s International Conference in Minneapolis! The dates are Wednesday and Thursday, August 1st and 2nd — some additional information is available here: http://www.aprahome.org/p/cm/ld/fid=72. The fundamental track is intended as a two day introduction to analytics in fundraising, with the goal of giving participants a solid road map to approach their first project. Topics will include: Various Variables: Data Preparation and Management for Successful Analytics, Walkthrough: Understanding the Problem and the Resources, Key Questions in Project Management, and Implementation. Presenters will include Chuck McClenon at the University of Texas, James Cheng at Dana Farber Cancer Institute, Audrey Geoffroy at the University of Florida, and myself. In addition, six short case studies from a variety of nonprofits will be presented in the fundamental track. In the intermediate/advanced track, we will continue the focus on case study with nine short project presentations. We will also have a presentation from Jeff Shuck of Event 360, who applies predictive modeling and segmentation to fundraising events and peer-to-peer fundraising programs. Marianne Pelletier of Cornell University and Josh Birkholz of Bentz Whaley Flessner will present on constituent engagement. Chuck McClenon of the University of Texas will lead a panel of practitioners to discuss the intricacies of collaborating with development IT. Finally, we will have our usual faculty/committee panel to close the Symposium. We will be asking our faculty, committee members, and a few guests to tell us about the one best idea they’ve heard recently in the area of development analytics, and follow up with a free-wheeling conversation including these ideas and any and all questions from the floor. Last year we experimented with a case study format that gave us the opportunity to hear many of our colleagues present on projects they are working on at their institutions. As you see above, with a few tweaks, we are continuing to set aside some time for case study this year. If you’re planning to attend, I’m hoping some of you might have a project you’d be interested in presenting? You will have 20 minutes to present a project of your choice and take a few questions. Emma Hinke at Johns Hopkins has kindly agreed to handle the logistics of case studies for me, so if you have an idea, or would just like more information on the case studies, please be in touch with Emma at ehinke2@jhu.edu. If we have a great flood of ideas, we may not be able to pack them all in, but wouldn’t that be a great problem to have? Please send us your thoughts, and if we can’t manage them all this year, we’ll start a list for next year. I do hope you will consider joining us — it’s the variety of attendees that makes the Symposium great. I’ll let you know when we have the full schedule up on the Symposium web site. In just a few days I’ll be in Toronto for APRA Canada’s second national conference (13-15 Oct), where I’ll be co-leading a half-day workshop on data mining with Peter Wylie. “APRA” stands for the Association of Professional Researchers for Advancement, so we’ll be addressing to prospect researchers working primarily in Major Gifts for universities, hospitals, arts organizations and other non-profits from sea to shining sea. So we’re giving it a shot: Three hours of working with real data, building real models, in real time. Peter and I have been working with two institutions over the summer — the University of Manitoba, and the Toronto Symphony Orchestra. They have provided us with anonymized data, including as many potential predictor variables as they could easily obtain, and we’re going to provide them with customized score sets that they can use in their fundraising programs. What those looking on should gain is a real sense of what data mining “looks like.” The live demonstration will be software-specific (we will be using Data Desk), but the essentials are perfectly applicable to one’s software of choice. Ideally, we’d have everyone sitting at a computer going through the steps with us, but that’s not possible. The central idea is to get one step beyond simply talking about data mining and predictive modeling, and actually demonstrate it in a visual, physical way. We welcome you to join us, and if you happen to see either of us between sessions, by all means introduce yourself and ask questions!